NTFS permissions are used to manage access to the files and folders in NTFS file systems. 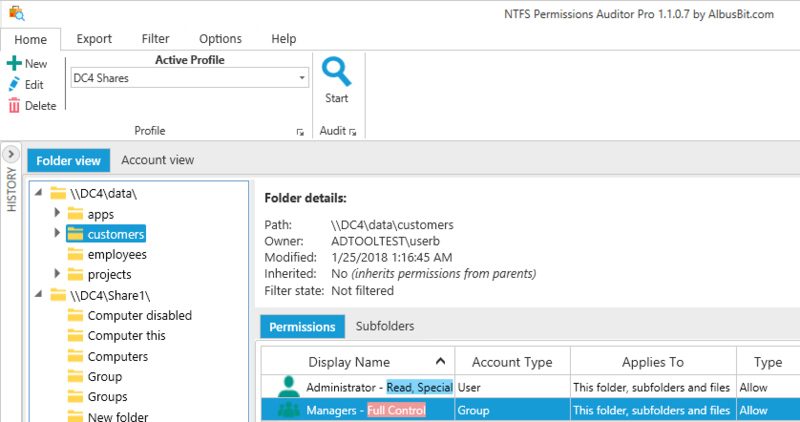 NTFS Permissions Auditor allows you to quickly analyze, verify and review any NTFS folder permissions. Our free version provides you with deep and detailed audit results while the Pro version offers additional features such as powerful, customizable filtering, exports to various formats, and more. 1. Select or import directories you want to audit, or search for other shares and add them to the audit settings. 2. Configure additional audit settings if required or simply leave the default settings on. 3. Press ‘Audit’ and wait for all folders and their NTFS permissions to be scanned. When the audit results are ready, you can view or export them to a file. Get up and running with just one installation – no other configuration is needed. Immediate and accurate insights into NTFS permissions for all target folders. The filters incorporate lots of factors – use ‘And’ and ‘Or’ to manage them and get the information you need. You can even add more factors after you’ve filtered by department, position or manager if necessary. 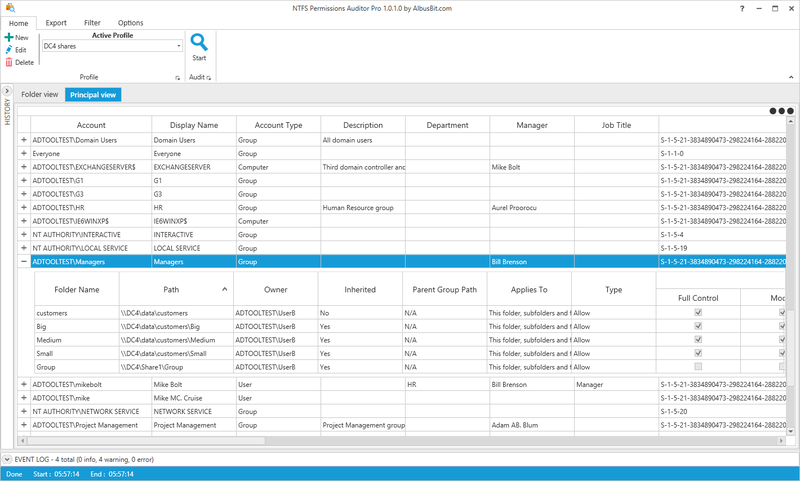 This view allows you to see users and groups, and all the rights and directories for each user. To make results faster and more efficient than with similar tools. You can export audit results to a range of file formats including Excel (XLSX), CSV, XML, HTML and PDF. Exports can be performed in two ways – folder view export (categorized by folders) and principal view export (categorized by accounts). Hierarchical folder view providing all folder details such as path, owner, permissions, etc. See all users, groups and computers, and all directories to which they have access. See the main information about the account – display name, security identifier (SID), description and additional data such as department, manager, job title, etc. 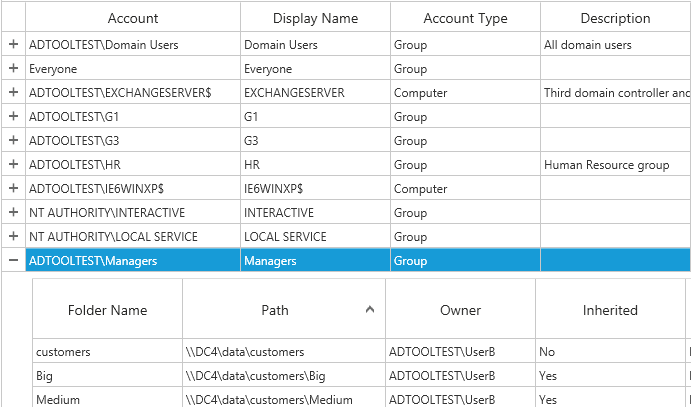 For group accounts, you can display information about direct and nested group members. 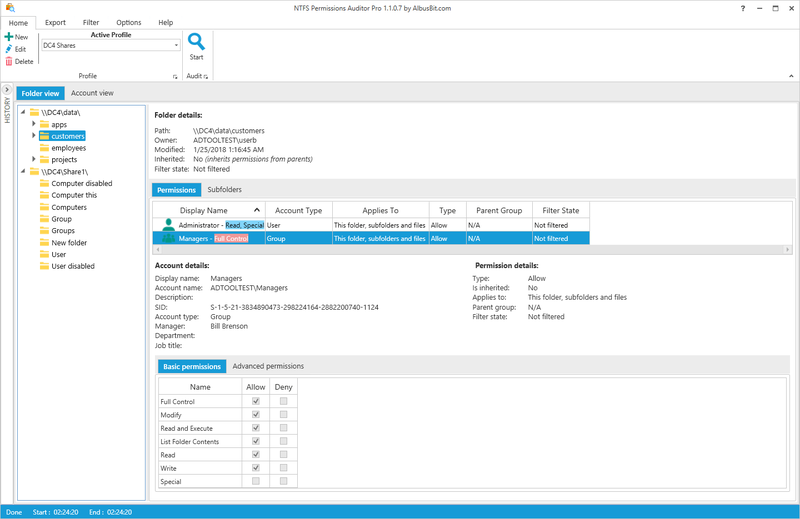 The filter manager offers a wide range of options to filter audit results and can be applied in two ways – audit time filtering and post audit filtering, which enables you to filter data and change filter conditions without needing to redo the audit. Exclude unnecessary directories by specifying the exact path or just the directory name. You can also exclude system directories and reparse points from your audit results, limit audit depth by specifying directory depth limit and exclude disabled accounts and specific accounts from audit results. All data can be stored in the local, secure database. No additional setup is needed – it’s all included in the installation. You can access historical audit data at any time. Fast and efficient, it uses RAM and CPU efficiently to generate results as quickly as possible without overloading PC resources. It uses various caching mechanisms to reduce Active Directory request counts to the minimum. You can compare two audit results and see what has changed. Change reports will show you which directories, directory permissions and group members have been removed, added or modified. 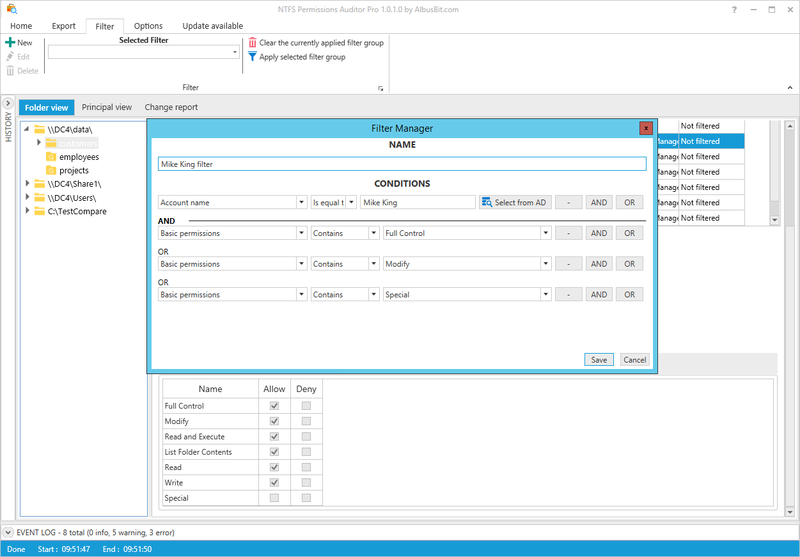 NTFS Permissions Auditor: No-Nonsense file system security auditing and reporting. 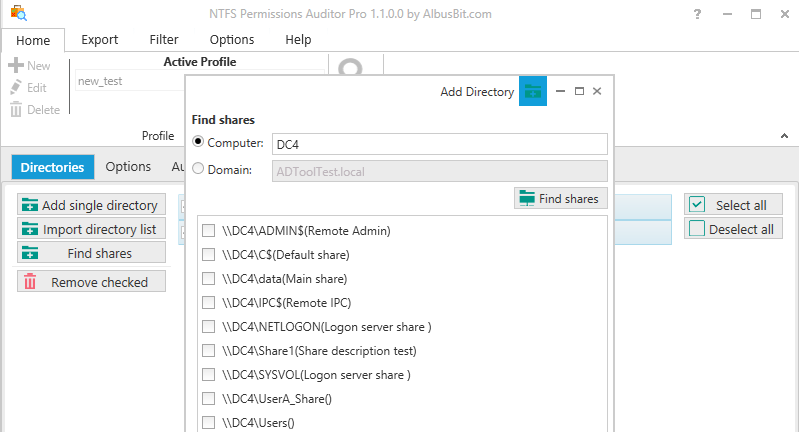 Albus Bit NTFS Permissions Auditor is a lightweight, easy-to-use permissions analysis tool that helps you enforce the IT security principle of least privilege. 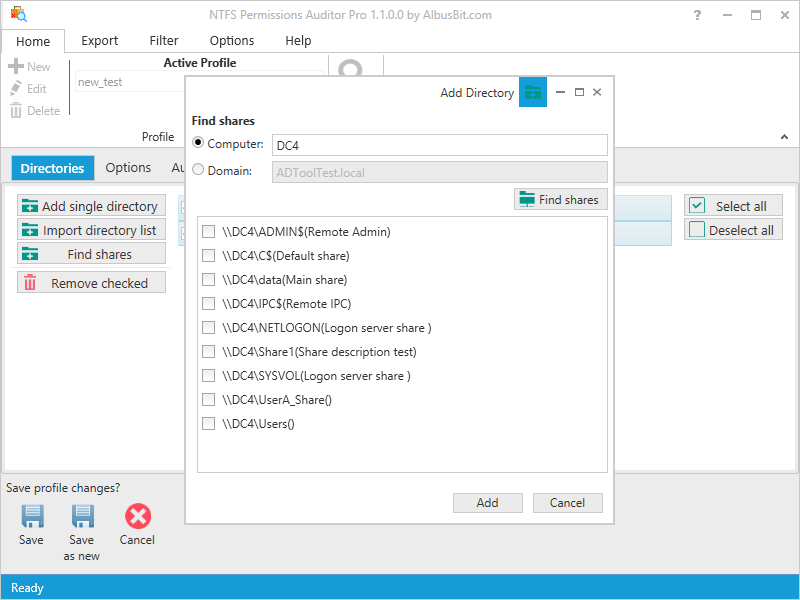 NTFS Permissions Auditor is very good product.